Yesterday was Singles Day in China, celebrated on 11/11 each year and theoretically to honor young adults who are not in relationships. In practice it is essentially an invention by retailer Alibaba who holds massive online sales on this day across their platform (Taobao, Tmall, etc). Alibaba reported over $30B in GMV yesterday across its platform of sites for the 2018 Singles Day. 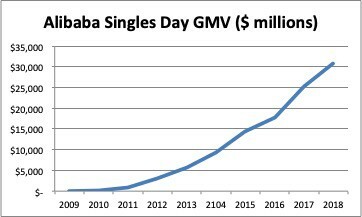 Alibaba’s total alone dwarfs Black Friday and Cyber Monday combined in the US which was roughly ~$14B combined in 2017.Alibaba’s Singles Day GMV total has posted an astonishing 144% compounded growth rate since 2009. Other Chinese e-commerce companies like JD.com will likely do tens of billions in sales in their own one day or multi-day sales. In the US, we’ve seen other retailers invent days to stimulate demand. Though the “Black Friday” moniker wasn’t applied until sometime after WWII, the day after Thanksgiving was invented as a shopping day over 100 years ago. Canadian department store Eaton’s started the first Thanksgiving Day parade to kick off holiday sales, which Macy’s copied to turn the Friday after Thanksgiving into a retail bonanza. More recently Amazon launched Prime Day in 2015 and other retailers have followed. I’ve been thinking about Singles Day and these other demand stimulating “holidays” a bit, and wanted to dive into a few questions about them. Do these kinds of invented days actually work for retailers? Just looking at the sales totals, it’s obvious that there is a great deal of money being made on these days. So in that sense, it’s hard to argue that they don’t “work” for retailers. But top line revenues are only one aspect of success. One obvious question is whether these shopping holidays stimulate incremental consumer demand or if they simply “pull” forward purchases that consumers would have made anyway in the future. While there’s lots of statistics and sales figures reported about Black Friday, Singles Day, and the like, there’s remarkably little economic research into them. Black Friday in particular would be hard to disentangle from consumer behavior during the busy holiday shopping period in the US between Thanksgiving in late November and December holidays. We can look at other examples of uniquely incentivized shopping days as a proxy. A variety of states designate one day per year as a sales tax “holiday” where most retail purchases are exempted from sales tax. But the research done by the Federal Reserve and policy groups shows that little to no incremental demand is generated… consumers are simply shifting purchases they would have made anyway to that day. Another measure of success would be how these shopping holidays impact profitability. They typically feature a handful of deeply discounted sales items, often sold as loss leaders. But there’s lot’s of evidence that loss leader strategies work pretty well in terms of generating overall profitable business. The other big question is around capturing market share. Does creating one of these shopping holidays help shift share of consumer purchases to that retailer? Here, it’s hard to tell. Alibaba’s platforms are already a dominant force in Chinese e-commerce, so perhaps Singles Day helps solidify their position, but it’s not clear it helps them steal share. The other data point is Amazon. Amazon helped promote Cyber Monday as an e-commerce extension of Black Friday’s offline retail activity, and then started its own Prime Day in 2015. Prime Day is still a big deal for Amazon but other retailers quickly glommed on too… Target’s biggest e-commerce day of the year is now Prime Day and Walmart and others do big volumes on the back of what was theoretically Amazon’s holiday. So beyond headline revenue/GMV, it’s not clear that shopping holidays generate incremental demand or significantly shift share from other retailers. Should every retailer do this? We only have a limited set of data points to try to answer this. What we now call Black Friday in the US has been a widespread cultural phenomena for decades. But in the early days, Macy’s did probably create some initial advantage with its Thanksgiving Day Parade which brought incremental foot traffic to its stores and create a psychological anchor for kicking off the holiday shopping season. Retailers of the scale of Amazon and Alibaba are clearly big enough to create their own gravity in terms of consumer activity. Prime Day and Singles Day both generate many billions in sales, though competitors like Target, Walmart, JD.com, et al have piggybacked Amazon and Alibaba’s creations pretty successfully. A handful of other e-commerce companies have created their own shopping day. Wayfair created “Way Day” in April 2018. Overstock.com created “Customer Day” in 2018 as well though the latter was in essence a reinvention of the Anniversary Sale they’ve run in prior years. Wayfair appears to have garnered a bump in traffic from Way Day, though they didn’t release specific sales figures for the day. Wayfair is a very large business (nearly $5B revenue in 2017), but isn’t nearly as big as an Amazon or broad in terms of categories. Short of the giants, I suspect most retailers would struggle to see significant success or benefit by creating their own shopping day.